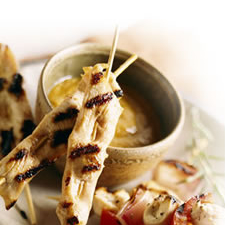 To prepare satay, combine chicken and next 6 ingredients (through 2 garlic cloves) in a medium bowl. Let stand 10 minutes. To prepare sauce, combine 1 tablespoon brown sugar and the next 5 ingredients (through 1 garlic clove) in a medium bowl, stirring until sugar dissolves. Thread chicken strips onto each of 8 (8-inch) skewers. Place chicken on grill rack coated with cooking spray; grill 5 minutes on each side or until chicken is done. Serve chicken with sauce. Per Serving (2 skewers and 1 tablespoon sauce)): 210 Calories; 5g Fat (24.5% calories from fat); 1g Saturated Fat; 29g Protein; 8g Carbohydrate; 1g Dietary Fiber; 66mg Cholesterol; 711mg Sodium. Exchanges: 3 1/2 Lean Meat; 1/2 Vegetable; 0 Fruit; 1/2 Other Carbohydrates.